It was a rainy afternoon in Providence, late in my final semester of college. I had recently finished a trial night working in the kitchen of an innovative Boston restaurant and was set on pursuing a culinary career after graduation. I planned to work my way up the line of a restaurant kitchen, starting as a dishwasher. Many thought I was crazy. I would be spending my summer knee-deep in chicken stock and piles of potato peels; I would see more towers of dirty dishes and butchered lamb carcasses than friends and family. I wanted to make sense of my experience, to record it in a pubic forum. So I sat down, began to write, and this blog was born. There were long nights hauling dishes and scrubbing still-sizzling sauté pans. I perfected my onion-chopping technique and peeled enough garlic to fill multiple swimming pools. I gained fifteen pounds of muscle and, as my mom said, began to resemble a line backer. I set an official start date at the Culinary Institute of America. Then, on a drizzly morning at the end of August, I was hit by a car. I lay immobile in bed for months with a broken pelvis, sacrum, skull, and torn knee ligaments. Slowly, however, they healed. More devastating was the severed olfactory neuron and resulting loss of my sense of smell. "The olfactory neuron is the only one in the body that will regrow," said the doctors at UConn's Taste and Smell Center, where I was tested in December of 2005. "Perhaps someday it will return." But no one really knew. There was a monotone nothingness in the space where fresh cut grass or 'new car' once resided. And taste is 80% scent; I could not perform in a professional kitchen. Six months later, when I could walk without pain, I moved to New York City and took a job at an art magazine. I fell in love with the rich culture and the frenetic movement of the city; I worked, wrote, partied, and cooked. I continued to heal. Smells that meant something to me came back first: chocolate, rosemary, wine. More followed in tiny, almost-imperceptible steps. Cilantro. Garlic. Laundry and soap. A year ago I had a whiff of spring. I was startled by a pile of rotting garbage. The other day I walked through Chelsea Market and was almost bowled over by the noxious smell of lobster oozing out of their seafood store. I've learned to cook and to enjoy food despite—and because of—my struggling olfactory sense. I have a new understanding of temperature, texture, and the visual aesthetics of food. I begin at graduate school for writing in August, still here in New York. I read through the archives of my blog this morning. I'm happy to have this record of my experience; it has been quite a couple of years. I've put together some of my favorite posts below. And of course thank you, all, for reading. Many things changed in the last few weeks of April. I was accepted into graduate school and mulled heavily over whether or not to attend. I helped to throw a (massive) dinner party. The trees sprouted, crocuses popped their heads out of the earth, and I began sneezing myself into fitful nights of hay-fevered sleep. One of my roommates decided to move and Jon and I began to search for a replacement. I said 'yes' to returning to school just the other day and then gave a two-month notice at my job. And so I suppose it’s not so very surprising that amidst all that change there have been other, smaller adjustments as a result. For example: my daily excursion from the office to re-caffeinate myself. Every afternoon I steal out of work and take a walk, punctuated with a large cup of coffee. In the last few weeks, however, I've often found myself strolling down Madison Avenue in midtown Manhattan not with coffee, but with an ice cream cone in hand. The effect that ice cream has on my mood can be drastic and is a phenomenon widely noted by those close to me. Some have even suggested that there may be something wonky with my brain's wiring. Even on days where the stress of impending decisions mixed with the exhaustion that comes hand-in-hand with my Spring allergies feel like they may swallow me up whole or cause me to "inadvertently" kick the next person who gets in my way as I walk down the street, a scoop of chocolate can pull me out of my grumpy abyss to be a functional human. There is something inherently cheerful and child-like about the act of walking down the street holding a cone. When I studied in Florence for a semester, the first thing that struck me about the city wasn't the massive Duomo or the colorful buildings overlooking the river Arno, but was the sheer number of people traipsing down the cobblestone streets with cones of gelato in hand. They weren't just tourists, not only children – but white-haired, stooped grandmothers and business men in suits, couples in love and groups of young men wearing ripped jeans and leather jackets. It was normal to walk down the street with an ice cream cone and I loved that. And I'm not sure if my daily ice cream excursions help in the decision-making processes or stress-reduction attempts. But they are an excellent distraction (it's important to concentrate on the physics of the cone as you eat and walk, so that nothing melts onto your clothing and you don't inadvertently walk back into the office with chocolate smears on your nose) and certainly made me a more palatable individual to have in the work place. This weekend, however, I decided that for the love of my arteries and bank account I should instigate a bit more change into this new routine. With the inspiration of David Lebovitz's cookbook "The Perfect Scoop," I made frozen yogurt. I love the tangy, slightly sour taste of plain yogurt – here it is chilled and churned with a bit of sugar. It is reason enough to transplant my daily fix from Madison Ave. to the shady stoop of my apartment. Now I just need to go to the store and buy some cones. Mix together the yogurt and sugar until dissolved. Refrigerate for at least an hour, and then churn in an ice cream maker, per the instructions of your specific model. The last loaf of bread came out of the oven golden brown and crusty. An instant thermometer stuck in its meaty belly registered a perfect 200 degrees. With hands in oven-mits, I placed it to cool on a rack on the kitchen table. Seven other loaves— equally bronzed, slightly misshapen and dimpled—perched nearby. It was not yet 10am on a Saturday morning and the breeze coming through the window fluttered the pages of my open cookbook; I could hear the chatter of kids outside. I threw off my flour-dusted apron and inspected my little herd of bread. For a make-shift bread baking operation—one that involved rough planks of wood covered in parchment to balance rising loaves and reused pickle buckets to hold the fermenting starter—they turned out very well. Cracked and crinkled with good crust and crumb. I was relieved. Though I’ve been baking a lot of bread lately, this was the first time I had attempted any form of mass production in my tiny kitchen, in my tiny oven. And this bread was important. Sliced, piled on trays, and perched on the white linen of three long dining tables, it was the first thing the 28 guests would encounter as they arrived that night for a meeting of the “roving supper club” orchestrated by me and my friends Ben and Philissa. Our supper club was an informal, semi-spontaneous gathering of friends—an eclectic group, of all ages and professions—who came together for an evening and an inventive five-course meal. We cooked and served in the spacious apartment of a friend. Ben - a talented self-taught chef and teacher by day - reigns over the savory while I am pastry chef. I have found that baking involves an exacting adherence to science, a precision of touch and aesthetic view; I don't need a full sense of smell to succeed. 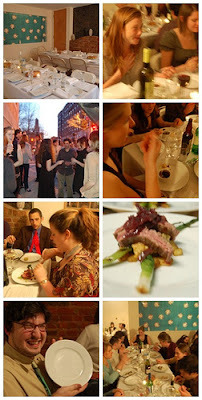 We had been talking about beginning this supper club for a while. We had tested recipes and planned menus, debated venues and price. But despite our enthusiasm it was a large undertaking and I was not sure it would ever come to pass. But then (and what felt like suddenly) it did. Emails were sent and RSVPs taken; chairs and tables and crate loads of plates were rented. 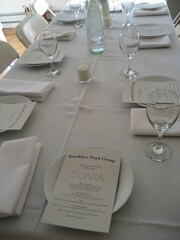 Menus were printed and tables set. Ben played with homemade stocks, soups, and picked vegetables. He debated buffalo versus steak. Trout versus tuna. Grits and risotto. Morels and portabella. Sunchokes and ramps. I played with raspberry gelees and peppered biscotti. Ginger snaps and shortbread. Ice cream bases were created on a tipsy Friday at midnight. Fermenting bread base littered my apartment’s refrigerator. And around 7 on that Saturday night guests began trickling in. Bearing bottles of wine they congregated in the dining room as the light slowly faded outside. Ben and I, sectioned off in the small kitchen with strategically placed tapestries, moved quickly to get everything ready to the background sound of laughter and clinking glasses. When all twenty-eight guests had arrived and settled in, we gave a few words of welcome and introduction. People sat at the three long, white-linened tables, a menu perched at their place. It was quite a group—mainly friends and friends-of-friends, but ranged from teenage to grandmother, work colleagues and bosses to dancers and writers, comedians and bankers. Ben and I scurried back to the kitchen to begin plating the first course. Philissa, who decorated the apartment beautifully, helped serve. Preparing and executing all that food for so many people was wild and perhaps a bit crazy. It was a night filled with movement and hectic timing. There was a constant sense of urgency; adrenaline soared. The possibility of catastrophe lurked. We moved quickly through the kitchen—grilling scallions, searing meats, spooning a nutty brown romesco, poaching asparagus. Bent over the white dishes lined on an overturned bookshelf, we plated each course with attentive detail. The close quarters, the heat of the oven and the constant desire for speed reminded me of when I worked in the restaurant in Boston. Time flew. Against the hum of chatter and merriment, I concentrated on the immediate sizzle and sear, steam and boil. 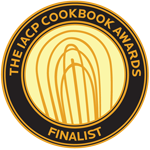 I could feel the heat of the oven, an occasional flash of burn on my hands as I grabbed pots and pans, the weight of plates in my hands as I brought them out to the smiling eaters. Later, guests said that they had no idea how hectic it was in the kitchen. They just registered the calm presentation of food, in evenly-spaced courses. And that was the point, I suppose. Just as when I worked in that Boston kitchen, the steaming speed of the grill line and the Chef, the yelling and the slamming of sauté pans was a world so far removed from the dining room only three feet away. Adrenaline propels the food to its calm destination. 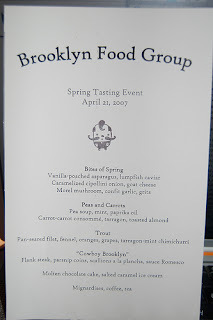 The first course, “Bites of Spring”, was a plate containing three small creations. Vanilla-poached asparagus on toast with lumpish caviar; a caramelized cipollini onion topped with goat cheese and a spiced pistachio; a sautéed morel mushroom filled with confit garlic grits. Then came “peas and carrots”: two small bowls, one of pea soup with mint and paprika oil, the other of carrot-carrot consommé with tarragon and toasted almonds. A slice of oozing grilled cheese sat in between. Next was a seared filet of trout balanced on a salad of fennel, orange, grape, and tarragon-mint chimichurri. Then, slices of flank steak were laid over parsnip coins, grilled scallions a la plancha, a dollop of a rich and bronze sauce romesco, a dollop of pickled red onions on top. For dessert were individual molten chocolate cakes nestled in ramekins, a scoop of salted caramel ice cream by its side. I was very proud -- when the piping hot cakes arrived at the tables there were quiet moans of pleasure. Later, with tea and coffee, came plates of ginger snaps and lemon shortbread. Five courses and three hours later we were done. People were happy, full, tipsy. It was a challenging, exhausting night. One that we hope to do again soon. Later we went to a nearby bar to decompress and celebrate. It was a day that began with a herd of bread and ended with a round of toasts. *check out onenicething's flickr page for some beautiful photos!